Multi-display adapter with included DVI-VGA adapter allows you to easily add a secondary screen to your laptop, Ultrabook, Windows 8 tablet, Surface Pro, MacBook or other Apple computer to increase productivity. Simply connect one end to the monitor projector or TV screen and the other to your laptop Ultrabook or Windows 8 tablet USB port. USB 3.0 is 10 times faster than standard USB connections for fast streaming and superb picture quality. High-definition graphics support resolutions up to 2048 x 1152. Adapter is powered directly from your USB port to eliminate the need for an external power supply. Universal design is compatible with any brand or model of laptop or Ultrabook with USB. 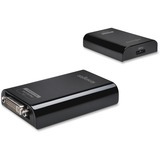 Multi-display adapter supports a connection to monitors, projectors and HDTV screens.